This article is about the character. For the guest star, see Doris Kearns Goodwin. Doris Kearns Goodwin is an American author. Moe was reading her book, Team of Rivals, at Bookaccino's. He was only reading the book there as he had never paid to read Doris Kearns Goodwin, and he wasn't going to start now. She taught Lisa's class when she was at school in Boston. 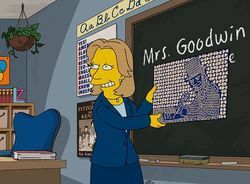 She liked to use macaroni pictures to teach. Modified on October 11, 2016, at 06:47.